November 30, 2010 - Avidyne Corporation, a leading provider of integrated flight deck and safety systems for general aviation aircraft, announced customer delivery of the first Entegra Release 9-equipped Piper PA-46 Matrix aircraft. This was the first PA-46 aircraft to get the R9 upgrade, which includes dual IFD5000 integrated flight displays and dual FMS900w WAAS-capable flight management systems (FMS). ?The Matrix is a terrific cabin-class aircraft and the Entegra Release 9 suite adds significant capability,? said customer Mark Mathys of Ohio. ?Having already flown for over 20 hours with the system, R9 has given me more confidence knowing that I am flying the safest, most modern glass cockpit on the market.? 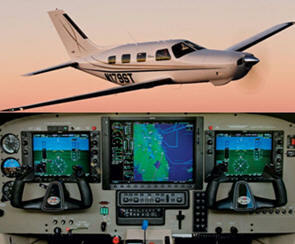 Entegra Release 9 is a complete upgrade of your existing Entegra-equipped Cirrus avionics suite. This upgrade involves removing your old PFD & MFD and your old GPS/NAV/COMs and replacing them with an all-new, state of the art flight deck system. You?ll get high-res glass, dual ADAHRS for added redundancy, and dual FMS900w Flight Management Systems with QWERTY keyboard. With its fully-modular architecture, Entegra Release 9 represents the next generation of integrated flight deck systems for general aviation aircraft. The Entegra Release9 includes high-resolution IFD5000 displays, dual Air Data and Attitude Heading Reference Systems (ADAHRS), dual-redundant FMS900w systems with a QWERTY keypad, next-generation fully-digital 16-watt VHF NAV/COM radios, and dual WAAS/RNP-capable GPS receivers. Release 9?s innovative Page & Tab user interface makes it a breeze to quickly access data without delving into hierarchical menus, pop-up windows or hidden modes. Designed with a fully-redundant architecture, each IFD5000 is fully capable of performing the functions of the other with no unfamiliar or limited reversionary modes. With Entegra Release 9, Avidyne has developed a truly integrated system that is specifically designed to eliminate complexity, reduce head-down time, provide a whole new level of redundancy, and dramatically enhance safety. ?We are pleased to have completed the first Matrix with Entegra Release 9 for Mr. Mathys, adding to the growing fleet of satisfied R9 customers,? said Patrick Herguth, Avidyne?s Chief Operating Officer. ?Combining our innovative dual-databus system architecture, highly-capable dual WAAS FMS systems, and an intuitive user interface, our customers are finding that Release 9 reduces pilot workload and allows them to fly more confidently in the IFR system.? The Entegra Release 9 retrofit for Piper PA-46 Matrix aircraft includes two XGA high-resolution IFD5000 displays, dual-redundant FMS900w systems with FMS keyboard, next-generation fully-digital 16-watt VHF NAV/COM radios and dual WAAS/RNP-capable GPS receivers.